At St.Patrick's assessment and reporting is a very important component of our teaching and learning. Our assessment helps us prepare our classes while reporting is used to open communication with the guardians of our students in order to gain optimum outcomes. Data driven instruction will lead to targeted teaching and learning. We use both internal and external tools for assessing and analysing data. Reporting happens throughout the term both informally from day to day and formally at the end of each term. At the end of terms 1 and 3 teachers will provide a learning journal of the child's work and a written explanation of the achievements and new goals of each student. Students will receive a graded report card at the end of each semester. At St. Patrick's School, assessment will be constant and will involve evaluating children's acquisition of knowledge, skills, values and attitudes. St Patrick’s provides a faith based education and teaching Religion is a very important part of our day. We follow the church’s calendar and celebrate important events and periods such as Easter, Advent, Lent, St. Patrick’s Day and Christmas. 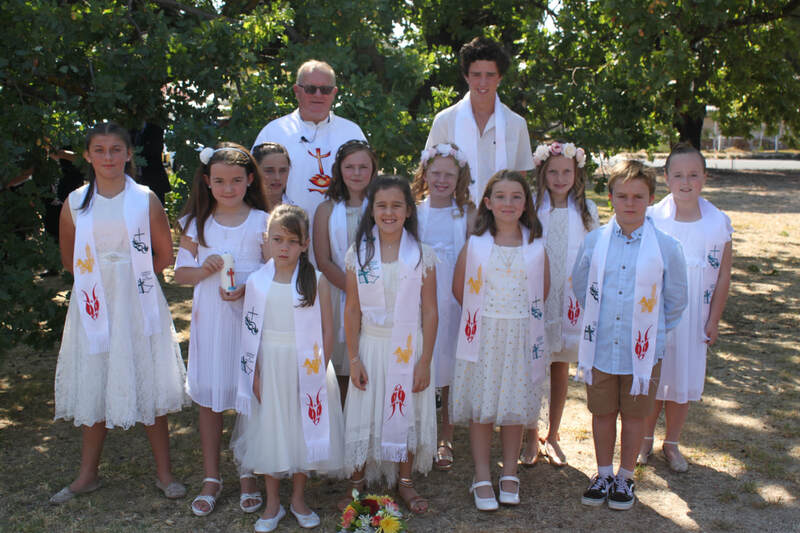 We follow the Awakenings curriculum as mandated by the Catholic Education Office of Ballarat. In Religious Education we encourage our students to sympathise with others, be aware of the Catholic tradition through the Church, be familiar with Religious stories, be familiar with Catholicism and other faiths and live and behave in a respectful manner. Religious Education is taught for 30 minutes per day. It usually involves reading a story, sharing ideas, discussing how that story affects our daily decision making, and responding more personally to the stimulus. Our children’s religious backgrounds are varied; many of our enrolments are Catholic and many are not. Our program caters for all students, ensuring that we include the teaching of common and secular values within our curriculum. We believe that literacy underpins all other learning, and therefore treat the study and practise of it accordingly. English literacy is taught for the second two hours of every day, with separate sessions for reading, writing and spelling. Every session has a specific skill that our teachers focus upon. Our students are made aware of what they are aiming to learn and can verbalise their goals. Our planning is informed by data collection. This allows us to provide curriculum that is designed to meet the needs of the students. We have several intervention programs, such as MultiLit, QuickSmart and the ERIK program, available for children who are not progressing in English as fast as they should be. Likewise we have personal learning programs for those students who are performing above their peers and require extra challenges. The teaching of literacy has been a focus of our Professional Development throughout 2016 and will be continually monitored in future years. We prioritise literacy when allocating resources, resulting in excellent physical spaces and well trained staff supporting this area of the school. Maths is taught in the first hour of the day. Our programs are devised after testing and data collection. It is important that our students are given challenges that they are ready to face. This can be ascertained through various assessment formats, both formal and informal. Our Maths curriculum follows the Stepping Stones program. Our teaching offers an online component, practical hands on activities and take home worksheets that help inform parents of the content that their child is studying. The Maths program is assisted by online support such as Mathletics and StudyLadder. This is designed to not only reinforce learning at home but to keep our parents informed and connected to their child's progress. Our students complete a BluEarth session once a week and a Physical Education session once a week. BluEarth is a non-competitive collection of activities that is designed to increase a child's coordination, imagination, general balance and ball skills, allows them to strategise and introduces them to the concept of getting the best out of themselves and their friends. Physical Education is the teaching of specific skills for specific games, such as soccer, softball, basketball, and football. Both PE and BluEarth are taught by specialist teachers. We believe that Science education allows children to develop skills to gain an awareness of the impact of science on society, the individual and the environment. Science also allows children to develop their curiosity and a spirit of inquiry about the world in which they live. We run Science classes both inside and outside the classroom, as we wish to utilise St Patrick's vast school grounds and also our proximity to the bush. All kids love art! We maintain an art room that is available to our art specialist (in the weekly rotations) and to the classes during the week. Apart from a weekly session, we engage other artists, such as our cartoonist, to stimulate and to teach our children art skills. Music has grown in importance at St Pat's and we are proud of the experiences our kids are having in this space. All children have a 1 hour class music session. On friday afternoons some children are given the opportunity to join the choir, the band and recorder groups. Students are offered private lessons in violin, ukulele (intro to guitar) and piano. More than a 1/4 of our students are taking up this opportunity. We want to maximise the opportunities that technology is offering without exposing our children to too much screen time! We therefore use screens for learning and nothing else. Every student above Year 2 has a chromebook (small laptop) that is theirs for the year. Every student has a 'Google Account' with an email and a drive to keep all their work. The Google Account can be accessed by parents at any time. Our school teaches Spanish. The class will incorporate teacher instruction, online activities, and some Skype Spanish classes, as well as Spanish speaking visitors when the opportunity presents itself.